Driving into crowds of protesters was a right-wing fantasy long before Charlottesville. Driving into crowds of protesters was a right-wing fantasy long before the violence in Charlottesville. A vehicle is seen reversing after plowing into the crowd gathered on a street in Charlottesville, Virginia, on Saturday in this still image from a video on social media. 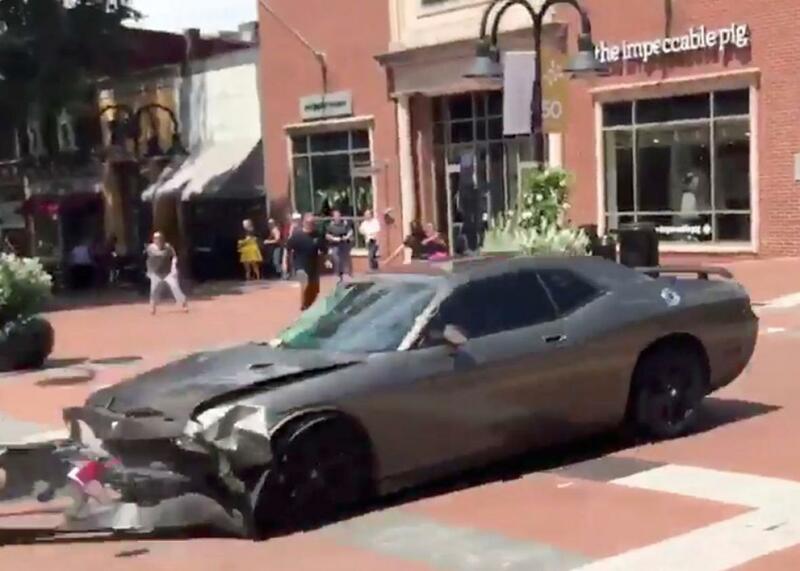 When James Alex Fields Jr. allegedly revved his Dodge Challenger toward the downtown mall in Charlottesville, Virginia, on Saturday afternoon, killing one woman and injuring more than a dozen others, he was taking a page from the ISIS playbook: Use a car as a weapon. That endorsement was the latest in a string of attempts by jihadis to promote car attacks, including a 2010 article published in the al-Qaida magazine Inspire that endorsed exactly the approach Fields is accused of having carried out. “If you can get through to ‘pedestrian only’ locations that exist in some downtown (city center) areas, that would be fabulous,” the magazine’s editor wrote. The ISIS call-to-arms came a few months after a terrorist driving a truck killed 84 people during a Bastille Day celebration in Nice, France, and was followed by deadly ISIS-inspired car attacks in Berlin, Stockholm, and twice in London. The frequency of vehicular terror attacks has spiked over the past four years. But Saturday’s attack also has a lineage closer to home: a long-running right-wing fantasy of running over protesters, especially members of Black Lives Matter who have blocked intersections and highways during rallies. It’s an idea, as the artist Gary Kavanagh observes, that has far broader currency than the white nationalism on display at the “Unite the Right” rally that brought Fields to Charlottesville. “Run them over” is a popular anti-BLM catchphrase, as this Tumblr by historian Liam Hogan demonstrates. This February, Troy Baker, president of the police union in Santa Fe, New Mexico, shared an image from the “Prepare to Take America Back” Facebook page, a right-wing meme factory with links to conspiracy theories. “All lives splatter: Nobody cares about your protest,” it reads over an image of a jeep plowing through a crowd. But “jokes” like those have been accompanied by a string of drivers doing exactly that. On July 10, 2016—the same day a South Carolina fire captain threatened to run over BLM protesters who had shut down Interstate 126—an SUV driver in southern Illinois plowed through a group of BLM protesters after yelling “All lives matter, not blacks, all lives.” Two days earlier, a driver had accelerated into a crowd of protesters outside the police department in Ferguson, Missouri. In January 2015, a Minneapolis driver lurched into a Ferguson solidarity rally and ran over a 16-year-old girl. This is not just a handful of sociopaths living out a 4chan meme. Across the country, Republicans legislators have attempted to codify the idea that protesters surrender their rights when they stand in the road. The philosophy behind these bills was elucidated by Keith Kempenich, a trucking company CEO and North Dakota state legislator whose mother-in-law was stopped by a Dakota Access Pipeline protest. “There’s a line between protesting and terrorism, and what we’re dealing with was terrorism out there,” he told the Washington Post. “[Drivers] who were legally doing their business or just going home and all of a sudden they’re in a situation they don’t want to be in.” Prominent right-wing figures like Milwaukee County Sheriff David Clarke have also referred to BLM as a “terror” organization. The Tennessee bill, like the rest of them, has failed. But it’s a reminder that in standoffs between protesters and drivers, many, many Americans want to shore up the rights of drivers, even if that means absolving them for whatever carnage they cause with their cars. In American cities, where drivers are almost never prosecuted for hitting pedestrians or cyclists, there’s a saying: If you want to kill someone and not get punished, use a car. The Fields attack, then, may borrow its tactics from ISIS attacks in European cities. But as an idea, it is also indebted to all the drivers who have plowed through BLM protesters in the past three years, to the jokes and memes that legitimized that response (especially from police officers), and to the legislators who attempted to make anything but a dead stop look like a defensible course of conduct. What makes this time different? Only that somebody died.